Are the Cartesio Journals and Planners Fountain Pen Friendly? What experiences have you had with this combination? I would love to know. Is there anyone who has used a fountian pen with their Cartesio Journal with unsatisfactory results? If so, drop me a line and let me know which pen and what type of ink you are using. I would like to do my own review on this notebook as well and would love to include your experiences as well. 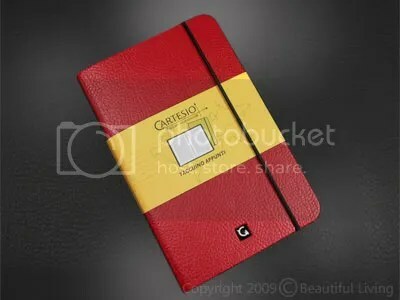 The Cartesio Journals come in pocket and large sizes similar to those of the Moleskine journals. They are available at http://www.journalingarts.com. Thanks, that’s good to know. It is interesting that you had different results with 2 different Ciak notebooks. What type of nib are you using? I am using Montblanc fine-nib and Pelikan fine-nib. The two journals I mentioned have different paperquality. The paper used in the Travel Journal is a lot thinner. Hmmm, I am surprised that the paper is different in the Ciak Travel Journal than is in the Ciak journal. Was the travel journal one that you ordered from journalingarts.com? If so, I remember these being the only three that Fiorentina US had on hand at the time. I wonder if these were preliminary samples or if the paper is different on these intentionally. I will send an email to Fiorentina to see if they have the answer to this and will comment when I hear back. Thanks for the info. I’m impressed! I haven’t heard from too many people that they are able to use a fountain pen in their Moleskine. Do you have any bleed through on the back of the page? I just added a picture to my review Montblanc Blue Black ink“. In my journals I always can write on both sides of the paper with this ink.